Starting a solar panel cleaning business can be intimidating at first, however, after doing a little research, starting a successful solar cleaning company comes down to a few simple bullet points and details. When starting any business, the first and foremost important question you need to ask yourself, is if the business model fits around your lifestyle, friends and most importantly family. Once you decide if the solar cleaning business model is for you, next determine your profit potential and if you are in a target market that can support enough future income to stay in business. The solar cleaning business model is an amazing opportunity, however, you will need to determine these factors before diving head first into starting a solar cleaning business. How much does starting a solar cleaning company cost? Who to Hire? 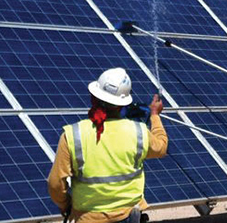 Solar Cleaning Sub-Contractors or Employee’s? Running a successful solar cleaning business can be done by 1 person, however it’s not going to be easy. In the beginning stages of starting your solar cleaning company (1-6 Months), start out by yourself and get experience in every aspect of your business model. From the initial paper work for filling a Sole Proprietorship or LLC (Limited Liability Company) to the ongoing Marketing (Cold Calling/ Traditional Marketing/ New Media Marketing/ Internet Marketing) and doing the actual work of cleaning commercial or residential solar panels. After you have experienced the entire process of running a solar cleaning business, you can now teach the skill sets you have learned to a Sub-Contractor or an Employee(s). Deciding to hire a Sub-Contractor or an Employee will depend on your budget and your profit potential. How to entice a Sub-Contractor to perform? Option A: Hire a Sub-Contractor to “cold call” prospects for a percentage of each job (10%-50%). This Single Sub-Contractor can call the prospects, set an appointment, and sell the prospect on a residual contractor (1-12 times a year). Once that Prospect becomes a client, that Sub-Contractor can perform the actual work of cleaning solar panels for the life of that client. Option B: Hire a team of Sub-Contracted cold callers along with a team of Sub-Contracted Solar Cleaners and Repeat the steps in option A. Option C: Hire a full time employee (admin) to answer phones, cold call and set appointments for a team of Sub-Contracted solar panel cleaners. The options for running a successful solar panel cleaning business are virtually endless, it will be entirely up to the business owner on exactly they want to structure their team of Sub-Contractors or Employee’s. When marketing a solar panel cleaning company, you will need to think outside of the box. Because your target market is so niche, there are only a certain amount of marketing opportunities you can utilize and become successful without wasting your money. Marketing Option D: Door to Door – Door Hangers to residential locations you know have solar panels. Know your customers and Target Market! Because your target market is so niche, you need to know your customers like the back of your hand. Your prospects are all owners or lease holders of solar panels and what is the one thing these people have in common? Solar panel owners and Lease holders all want to increase the performance of their solar panels and by cleaning solar panels on a regular basis, they can achieve those higher performance numbers. The income on owning a solar panel cleaning business is massive! Between commercial solar panels and residential solar panel installations over the years, the solar panel market is BOOMING! Similar to a window cleaning business, solar panel cleaning can be extremely lucrative when approached correctly and aggressively. According to cleantechnica.com, US Solar Energy Capacity Grew an Astounding 418% from 2010-2014, this means HUGE profit potential for your solar panel cleaning business. You can see, by locking in residual contracts where you clean your client’s solar panels clients on a monthly, bi-annual, or annual basis, your residual income will explode exponentially. Starting a solar panel cleaning company can be a very rewarding, lucrative business model if your customer service is professional, marketing is perfect, employees are determined and your drive is 100%!